The Vudu pay to view, rent or buy movie service has had an iOS update. The Walmart owned service which operates like iTunes, and boasts more HD titles than any other service, now lets buyers download content and watch offline. Previously the service on iOS was a stream only service needing an internet connection to use. The new download feature for Version 2 of the Vudu Player iOS App brings a feature that many would expect anyway for a premium service and may explain why many consumers are unaware of Vudu. The update already available on android phones also brings iphone closed captioning support, new look video player and other minor tweaks and bugs fixes. But it is the ability to download and watch Vudu/Ultraviolet titles offline on iPad and iPhone that will have most rushing to download the update. 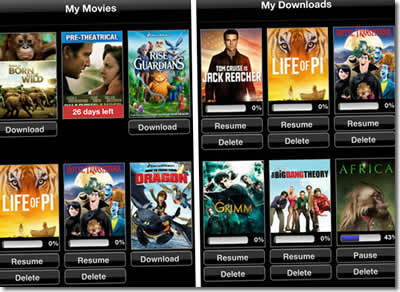 • You can now download and watch your collection of movies and TV shows offline. • We’ve listened to your feedback and made the Player easier to use. • Closed Captioning for the iPhone is now supported. (Closed captioning is already supported for iPad). • General bug fixes have been applied. Vudu users can grab the new update from the iTunes app store right now. The Walmart-owned Vudu is bringing its video streaming services to mobiles and tablets through a new app that will let you purchase and watch them on your favorite Android devices. The new Vudu app, which can be downloaded now and for free from the Google Play Store will also earn you up to ten free movie downloads to new customers–and the best news? You won’t need to enter payment information to get those downloads. Both standard definition and high definition content is available, however keep in mind that HD content generally costs more than its standard definition brethren. The addition of the Android app comes to the already large device streaming family that Vudu is available on. The Apple iPad and a slew of Roku set-top-boxes are also supported, in addition to video game consoles like the Sony PlayStation 3 and Microsoft’s Xbox 360. For those with a computer you can also stream content through supported web-browsers. 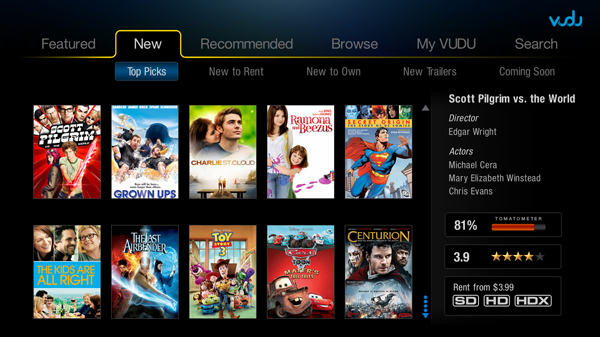 The big news though is the ability to take your Vudu movies on the go with your Android device. As an incentive to register your device with the service Vudu will offer you a $5.99 credit for each device you register, however to earn this credit you will need to register your Android smartphone. After completing your sign-up form through Vudu you will be presented with several free movies which include classics such as “Lethal Weapon,” “Psycho,” “Big Trouble In Little China,” and “The Producers” among several others. To download the new app just navigate to the Google Play Store on your Android device. The new flash-drive sized Streaming Stick from Roku will finally see a release, and it’s happening next the month. The device, which will work directly with your high-definition television set will be priced at just $99 and will be available sometime in October. 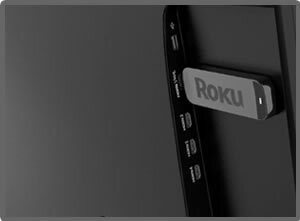 The stick, which is similar to the Roku 2 XS set-top box, will offer streaming television and movies directly through your HDMI port on your HDTV. Television manufacturer’s are already wanting to get a “Roku Ready” stamp added to their packaging boxes and many new manufacturer’s are racing to get their televisions up to MHI-compatibility by this fall, including Apex, Hitachi, and Insignia. The Streaming Stick will also include a motion control capable game remote that will allow you to easily access your content through the device. And if you don’t have any content straight out of the gate, that is fine too–as Roku has partnered with Walmart and their Vudu brand to bring you all of the streaming content that you could possibly want quickly and easily through the device. The Vudu app will bring you a quality stream of up to 1080p and an astounding 7.1 surround sound signal. For those who have Vudu-compatible UltraViolet titles already in their library, you will be able to easily view that content straight through the streaming stick. If you are wanting to be the first users to pick up the new Roku Streaming Stick, you can do so in October through Amazon and Roku directly. Other retailers will begin carrying the device later this fall. American retail giant Walmart have announced their plans to launch a new cloud storage-based method of selling movies, by offering customers the chance to convert titles they already own onto a Vudu account (the online streaming company being owned by Walmart), making the movies permanently stored for portable viewing on a range of devices. An arrangement was reached between the store and five of the six major movie studios (20th Century Fox, Paramount, Sony Pictures, Universal, and Warner Bros.) to give their backing (and licencing of films) to the project, known as ‘UltraViolet’. The new sales option will see customers able to go to a section of their local Walmart, where they will bring in their movies to be validated by an employee and added to their Vudu online collection (with an account sign-up being free), with pricing at $2 for a standard validation, and $5 for an HD upgrade version (from original DVD’s). There are also rumours that the service is being included for Asda, the UK brand of supermarkets owned by Walmart. As an act of retaliation at Netflix’s recent 60% monthly subscription fee increase, former customers of the popular online movie rental and Internet streaming company are switching their custom to Vudu, a similar service operated by supermarket chain Walmart. Netflix, who are widely known as the dominant force in both of their operative markets in the USA, are looking at a potential drop in customers following an increase on the subscription to $15.98 per month, and while that still sounds like a decent deal for unlimited DVD rental and online movie streaming, it is a big rise from the previous $9.99, and could affect their reputation just as they are planning to expand overseas. The subsequent gap in the market could now be capitalised upon by Vudu, a service run by Walmart (a company that already seems to be a market leader in many fields), and offering a more competitive price for what is essentially the same service (but accessible through an own-brand set-top box or a third-party connected TV). Vudu’s userbase has grown significantly thanks to the pulling power of Walmart (who purchased Vudu in 2010, when the service was 6 years old), increasing to a 5% market share at the midpoint of 2011, up from 1% at the same point 12 months previously. 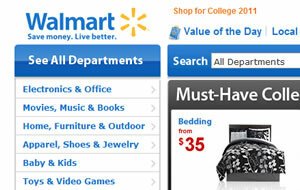 With Walmart now planning to add Vudu’s official homepage to their website, it seems as though a real challenger to Netflix could soon be found, as the supermarket giant have been seen to prominently feature and advertise the service, which has in recent months overtaken both the Sony PlayStation Store and Amazon in a customer numbers ‘ranking’ conducted by IHS Screen Digest Media Research, who officially put Vudu’s share of the total market revenue in the US at 5.3%. How much will that figure grow over the next year? WalMart on Tuesday began streaming movies on the same day that they come out on DVD/Blu-Ray, in another bid to take a piece of the movie rental and streaming business from Netflix, who coincidently just increased their subscription prices. 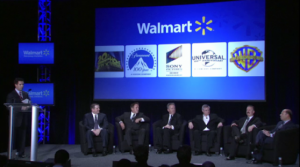 WalMart, the worlds second largest retailer, said it will fully integrate the online video service Vudu that it gained last year on to its website Walmart.com. 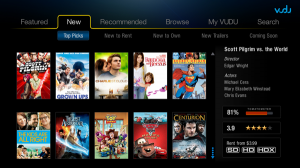 Vudu is a cloud based video and movie service that lets customers rent or buy movies over the Internet and stream them to their TV sets, Blu-Ray players and a variety of Vudu enabled devices such as the PS3 and HDTV’s from LG Electronics, Sharp and Panasonic. WalMart purchased video streaming service Vudu 18 months ago and now offers 20,000 titles that can be viewed on almost any device with Internet access, from computers to televisions to Sony’s PlayStation 3 and other Blu-Ray disc players. Movies are available at WalMart to rent for $1-$5.99 or to purchase for $4.99 and up. WalMart is not offering any subscriptions, making its service more similar to Apple’s iTunes store, which charges $3.99 to rent newly released movies and $14.99 to buy a movie. As of March, Netflix had 22.8 million subscribers in the US. about 34 thousand more than the number of households subscribing to Comcast’s cable TV service. WalMart who are based in Bentonville have tested the movie rental waters before. It previously offered a DVD by mail service that cost $12.97 per month for two titles and $17.36 per month for three titles. That was not a success, but we all know that the streaming market is a totally different ball game.